The 20km stretch of coast between Dubrovnik and Cavtat is known unofficially as the "Dubrovnik Riviera" and officially as the Zupa Dubrovacka named after the Zupa bay. Sunny and not overdeveloped yet), this region is predominantly agricultural and scenically stunning: arid mountains descend abruptly and then the terrain levels out as it approaches the sea. The vegetation is Mediterranean and the wealth of coves and beaches has made the region a favourite resort spot for locals and visitors. Just behind the mountains lies Bosnia-Hercegovina. 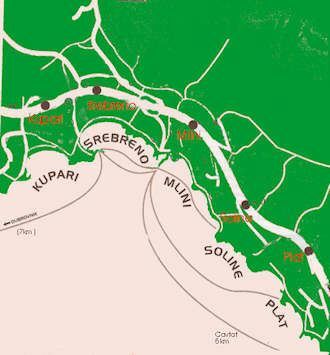 The principal villages of the Zupa Dubrovacka are Kupari, Srebreno, Mlini, Soline and Plat. Of these villages, Mlini is the largest and most developed, Plat is the quietest and Srebreno has the longest beach. At the moment, only Mlini offers accommodation although there are possible projects afoot in the other villages. Staying in Mlini is most handy if you need to be close to the Dubrovnik's airport at Cilipi. There's a pleasant campground in Mlini, Autocamp Kate, that's only about 5 minutes from the beach plus plenty of private accommodation and hotels. 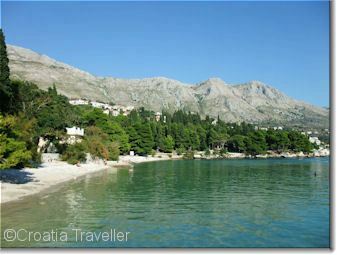 The tourist office of the Zupa Dubrovacka is in Srebreno (tel 020-486 254) at Setaliste dr. Franje Tudmana 7.